The two beleaguered entities in the Enbridge and Spectra Energy merger are seeing signs that things could get better. 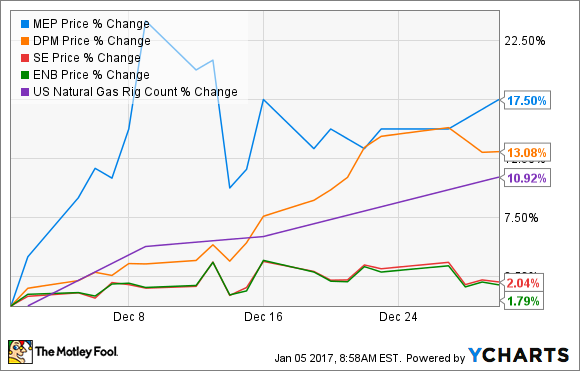 Shares of natural-gas-gathering companies Midcoast Energy Partners (NYSE:MEP) and DCP Midstream Partners (NYSE:DCP) climbed 17.5% and 13.1%, respectively, in December thanks to rising natural gas demand and production. The past couple years have been particularly hard for both Midcoast and DCP Midstream. Natural gas gathering and processing is a part of the natural gas transportation and logistics network that is most vulnerable to changes in production. The further away you go from the end user of a product, the less consistent demand can be. It also didn't help that, in several cases, the services these two companies provided were not on fixed fee or volume-protected contracts. A lot of Midcoast and DCP's woes were from a decline in natural gas prices and volumes, but we're starting to see a change on that frontier. Increased demand from U.S. liquified natural gas exports -- 1.5 billion cubic feet per day last month -- and from new natural gas chemical facilities popping up across the US are leading to higher prices. This is translating to more drilling and greater production. It shouldn't be surprising to see these gains in stock price when you also consider that the total count of active natural gas rigs in the U.S. has grown by 50% in the past six months. One of the reasons this is so important for both DCP and for Midcoast is because they were both considered problem children for their parent companies -- Spectra Energy (NYSE:SE) and Enbridge (NYSE:ENB). It also just so happens that the two parent companies are in the middle of a major merger. As recently as the second quarter of 2016, Enbridge Energy Partners (NYSE:EEP) was looking into strategic alternatives for Midcoast. Typically, the term strategic alternative is a veiled way of saying sell the business. Likewise, it wasn't that long ago that DCP's sponsor companies, Spectra Energy and Phillips 66, gave the company two long haul natural gas liquids pipelines and $1.5 billion in cash to prop up poor results. Since that time, though, a lot has changed. On top of the rise in gas rigs and consumption, the two companies have taken several steps to improve profitability. Midcoast announced during its most recent earnings release that it had cut costs significantly and would be able to fully support its distribution with cash from operations. DCP Midstream Partners, on the other hand, just announced on Jan. 4th that it would acquire all outstanding assets from the holding company co-owned by Spectra and Phillips 66 and become a stand-alone business. Both Enbridge and Spectra Energy have not made any mention how all of their subsidiary partnerships will be handled when the two combine, or whether it may need to sell some assets. With both Midcoast Energy Partners and DCP Midstream Partners looking like more stable companies lately, it will at a minimum make it easier to find a buyer if the combined company decides to unload these assets. Things are looking better at Midcoast and DCP Midstream Partners lately, and increasing natural gas production will help that along even more. That being said, there is still a lot up in the air between DCP's recent restructuring announcement and the Spectra Energy-Enbridge marriage that has not yet been finalized. These two things mean much could change quickly for both companies. Even though both have shown signs of improving, neither really has the balance sheet strength or operations results to have complete confidence to stand on their own. So until we get some more definitive decisions on what their parent companies plan to do, it's probably best to sit on the sidelines.